It's fascinating to think of plants as predators. They don't stalk or run down their prey, but they have developed different systems to lure bugs into their orbit, catch them, and eat them. Some use pitfall traps, catching bugs in a leaf container filled with digestive enzymes. Others lure them in, then close petal "doors" behind them. Still others have glue that hold the bugs in place until they can be digested. In the wild, carnivorous plants grow in wet peat bogs with soil extremely low in nutrients like nitrogen. These plants, like all plants, need nitrogen to survive, so they evolved into bug-eaters to get their nitrates. 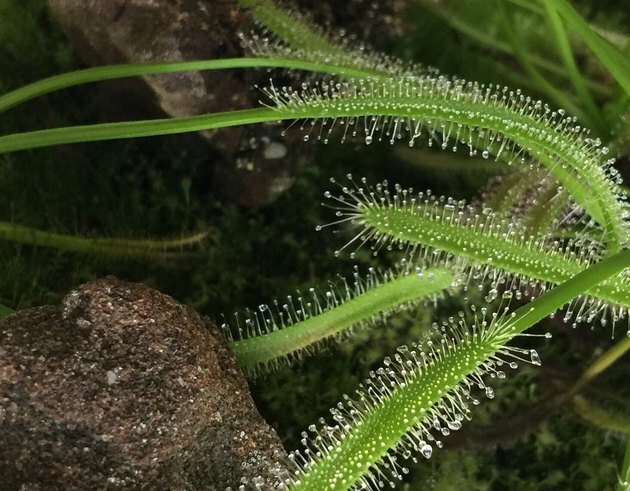 The plants adapted in different ways to catch insect prey and these weird and wonderful adaptations make them fascinating houseplants. There are over 700 different types of carnivorous plants on the globe. But if you are considering adding one to the household, here are three good places to start. The incredible Venus flytrap (Dionaea muscipula) captures bugs actively by waiting until a bug steps into their leaf structure, then snapping down modified leaves like little prison doors. 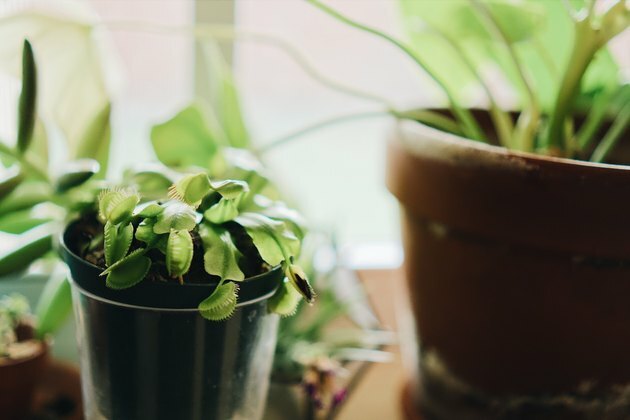 Most Venus flytraps are about 5 inches in each direction and have trap leaves, where insects are caught, about 1 inch high. Each Venus flytrap develops four "trigger hairs" on the inside of the trap leaf. The sweet-smelling nectar lures in the insect, but when it touches the trigger hairs, the trap closes. The bug is trapped inside where the plant's digestive enzymes digest its soft body parts. The hard exoskeleton is washed away when the trap reopens. Each trap only lasts through a few insect captures, sometimes only one, before it dies. The plant uses the energy obtained from the insect to produce more foliage and traps. If you've ever seen a pitcher plant, you'll understand how it got its common name. Its tube-like leaves look like pitchers and hold water. Some can grow to 36 inches long. Pitcher plants have sweet-smelling nectar at the base of the pitcher tube. Insects walk along the pitcher rim that is coated with slippery material. They get intoxicated by a substance in the nectar, slip, and then fall into the pitcher. The inside of the pitcher trap is either very smooth, or has downward-pointing hairs to keep the insects in. As the tube fills with insects, the digestive juice level increases and goes to work. 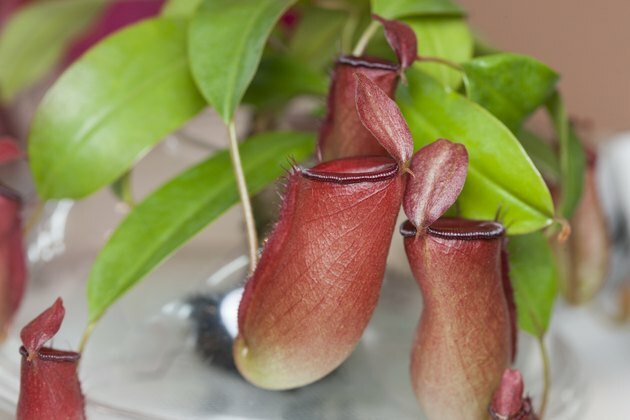 There are a number of different types of pitcher plants in the world, but in the United States, you are most likely to see two species. These are the North American pitcher plants (Sarracenia), native to this country, and the tropical pitcher plants (Nepenthes). If you've seen dew sparkling on garden plants in the morning, you have an idea of what sundews look like. Sundews (Drosera) are dainty little plants that seem to glisten in the sun. Their leaves are lined with hair-like trichomes, covered with dewy drops of liquid. The insects believe the drops to be dew or flower nectar, but actually, the drops are extremely sticky. Bugs landing on the hairs get trapped by the sticky substance. Then the sundew leaves wrap around it, holding it even more tightly. The trichomes secrete enzymes that break down the bug bodies and digest them. Like other plants, carnivorous plants have particular needs when it comes to exposure, humidity, water, and food. You'll want to take this into account before you bring one home. Most prefer bright light and high humidity. They are picky about soil, so don't dig it up from the garden. Use live or dried sphagnum moss, or a mix of three parts peat moss to one part sand. Likewise, no tap or mineral water for carnivorous houseplants. Use rainwater or distilled water. 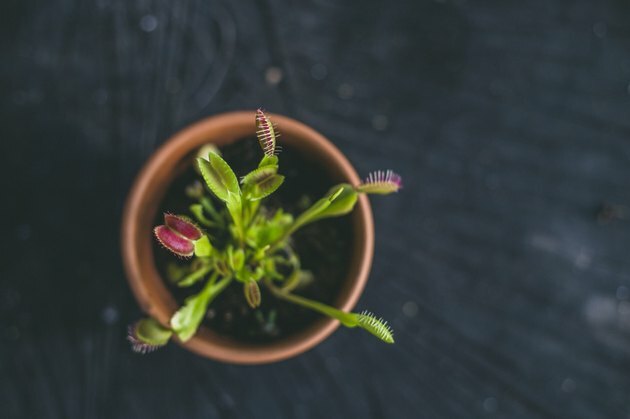 What about food for carnivorous plants when no bugs can be found? No bacon or hot dogs please! Use organic fertilizer at one-quarter strength. Are Silverfish on My Mattress?